Black Peak as seen from high on Mount Goode's Northeast Buttress (summit at right). With a new-found penchant for climbing northeast ridges, inspired by recent success on a climb of Mount Triumph’s Northeast Ridge, Eric’s suggestion to climb Black Peak was music to my ears. Once again, the good weather promised to hold. The opportunity of squeezing in another classic alpine rock climb, before the autumn rain comes was just too tempting to resist. Well okay, that’s the same justification I used for the previous climb. Besides, my previous attempt at Black Peak’s Northeast Ridge was thwarted last September due to an unexpected dusting of snow on the route (Scott, Ryan and I punted up the South Ridge instead). From the lake, we veered right, traversing below Black Peak’s impressive East Face, aiming for the heather bench and perennial snowfield/glacier that lies below the Northeast Ridge (low angled but icy in early October). Once across the snowfield, we scrambled up loose 3rd class rock to reach the 8000-ft notch in the Northeast Ridge. After a quick snack break, we roped up and discussed how we wanted to go about climbing the route. I agreed to start out on lead with the option of Eric taking lead about half-way through the climb. I easily climbed over the first step; the same spot that stymied me last September due to snow and verglas - see here. We continued along the broad and sandy ridge for a short distance before being confronted by a couple of options. We could either begin climbing steeply upwards on the craggy ridge, or traverse left out onto the East Face for a while to bypass the many small towers prevalent on the lower ridge. We chose the latter option. The traverse was loose and unpleasant with the added frustration of constantly snagging the rope. We picked a spot to begin climbing up that was roughly in-line with a small notch, after what appeared to be the last of the towers making up the lower portion of the serrated ridge-top. I found a fig-8 belay device here and figured we at least weren’t the only ones to have gone this way. Eric and I simul-soloed (no pro) up loose, steep rock (class 4 - low 5th) that improved the higher we got. From the notch (~8200 feet), I traversed out over onto the right-side of the ridge, stepping onto a small ledge, and climbed back up to gain the crest. We then simul-climbed a long pitch of more 4th - low 5th class rock directly on the narrow and exposed crest. I felt somewhat handicapped climbing this portion of the ridge, as there was a fair amount of looseness to deal with. It wasn’t horrible, but just enough to keep me on my toes. I reached a comfortable spot to rest (~8500 feet), and reeled Eric in. Eric expressed a desire to lead the next few pitches, and so I handed him the rack and began flaking the rope. Following the path of least resistance, Eric traversed ledges on the left side of the ridge, and then turned right to gain a notch. Views from the Northeast Ridge, looking towards Golden Horn and Tower Mountain (left to right). From the notch, Eric climbed steeper rock directly on the ridge to reach the mostly horizontal crest. The rock had now become generally quite solid and the climbing, very enjoyable. Looking down from the last tower. Hardy and Golden Horn on horizon (left to right). The horizontal crest led to a short slab directly below the 5.6 step/tower that makes up the crux of the route. Still simul-climbing, Eric dispatched the step with ease, stopped to give me a belay and offered a hint as I neared the crux - look for a hidden hold up and left. Above the tower, the climbing became easier as the ridge leveled off just below the final summit block. We coiled in our ropes and scrambled up the last few feet to the summit (class 3 - 4). We reached the summit in about 6.5 hours from the trailhead. Looking to the west at Mount Logan and nearby peaks. Ragged Ridge, looking to the northwest. The peak in the foreground is Mount Arriva. Mount Fury and Luna Peak visible on horizon. 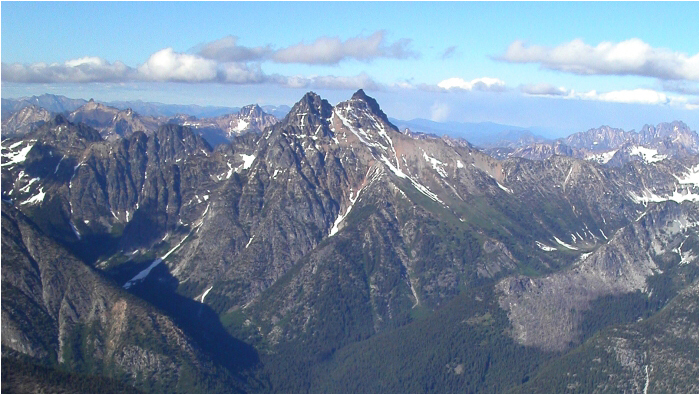 Mount Goode and Storm King Mountain (left to right). Looking down from the summit at Wing Lake and Lewis Lake in the distance. Corteo Peak at right. Up and left of Corteo are Frisco and Rainy Peaks. The large summits at top left are North Gardner and Gardner Mountains. After about 40 minutes of gawking at nearby peaks and achieving a state of complete relaxation, we began descending the south route. Down-climbing to the spot where we had previously coiled our ropes, we traversed right on crumbly ledges to reach the broad South Ridge. As in my previous visit to Black Peak, we followed the abundant cairns into a broad gully that descends the South Ridge to a gentle saddle high above Wing Lake. From the saddle, we descended scree and talus to reach Wing Lake itself. Retracing our footsteps, we reached the trailhead just before 5:00pm. Serenity at Wing Lake. Corteo Peak above right. Beautiful Autumn colors with Tower Mountain in background center. To the right of Tower closer to the camera is Porcupine Peak. One last look back. Northeast Ridge on right skyline and South Ridge on left skyline. All in all, Black Peak’s Northeast Ridge is a most enjoyable climb. Never too difficult or intimidating (despite some looseness early on), the route is all about good times and great views!